Trick or Tree—don’t get spooked by agroforestry! This block of workshops was all about opportunities for new entrants with tips and tricks on what to do and what not to do from practitioners. In this session exploring the practicalities of establishing and managing an agroforestry system, the panel of agroforestry practitioners and advisors shared key tips on the success stories and disastrous decisions of their agroforestry journeys. Planning for the end product was stressed as essential when designing the system, and proper attention given to ensuring good soil conditions (e.g. subsoiling if needed) before planting. The people factor was also considered a key factor in determining success, needing good communication with all involved (including the local community). It was obvious from discussions that in agroforestry there is no ‘one size fits all’ with some techniques working well in one site but not in another (e.g. mulch mats), and the value of monitoring the system and sharing the learning was highlighted. Short term nature of farm tenancies can be a problem when farm tenants want to plant trees, but there are models of cooperation between farm owners, farm tenants, and tree businesses responsible for the trees that can be used, such as that of the Dartington estate. Subsoiling along the tree row before planting can make it easier to plant the trees but can provide a protective highway for voles that then cause damage to the trees, plus in dry weather the line can open up and expose the tree roots. Early planting (ie in autumn) is recommended now as Spring is arriving earlier. Remember to loosen the tree ties! Diversifying the farming system through agroforestry can open up a range of new opportunities. In this session speakers presented their experiences ranging from establishing new tree crops leading to new markets, to new business partnerships, to identifying new products from existing woody resources on the farm. Ross Dickinson (Racedown Farm)	A coppiced Hedge - Is it economically viable to take selected hedges from annual flailing to a 15/20 year coppice rotation? The three speakers in this session presented a diverse range of new business opportunities for agroforestry systems. Subjects covered included starting a firewood business from coppicing field boundary hedges; plans for a diverse agroforestry system that will supply raw materials for cosmetics and an agroforestry nut tree nursery. 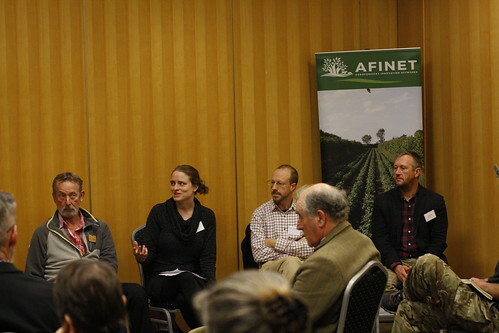 The session built on the conversations in the previous panel discussion with some really great practical examples of making agroforestry pay and a range of products and business models introduced that farmers may not have previously considered. Charlotte Steel from Lush explained the massive range of ingredients that are used in Lush products from birch water and charcoal to nut oils and chickweed which can be provided via agroforestry. Ross Dickenson’s hedge coppicing firewood business acts as a hub for wider local network of hedge coppicing and generates interest from neighbours. The nut tree nursery started by Ella Sparks as part of Schumacher college’s agroforestry system helps to meet the growing demand for nut trees from agroforestry systems and helps provide financial support for the rest of the five acre horticulture alley cropping system. Agroforestry offers viable (and additional) rural business opportunities by diversifying the range of products that can be produced, helping buffer against crop failures under climate change. There are existing gaps in the market for some agroforestry products, especially more specialised tree varieties and products. Nut trees are not a short term cash crop, the first yields cannot be expected for a number of years but they can help build resilience into the future.